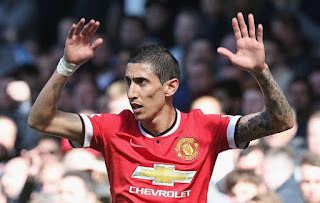 Paris Saint-Germain set to sign Angel di Maria Manchester United flop attacker Angel di Maria is set to complete his move to French giants Paris Saints Germain, according to boss Laurent Blanc. Manchester United flop attacker Angel di Maria is set to complete his move to French giants Paris Saints Germain, according to boss Laurent Blanc. SkySports reported that PSG manager Laurent Blanc has claimed that the French outfit are set to sign former Real Madrid attacker Angel di Maria. Di Maria who was signed for a record £59.7million fee last summer failed to make an impact at Old Trafford. The Argentine attacker has been linked with a move away from Premier League. Bayern Munich were also keeping tabs on him, however they have now signed Arturo Vidal from Juventus. Manchester United recently ended their preseason tour after a lost against PSG earlier today. In the post-match press conference Blanc revealed that they are closing on Di Maria deal. Di Maria was not included in the squad against PSG as he did not join the Man United party last weekend. Man United manager Louis van Gaal also said that he has no idea of Di Maria future. The 27-year-old netted three goals in 27 appearances in Premier League for Man United. Meanwhile, Manchester United have joined Chelsea to sign Everton defender John Stone, according to ESPN. The reports further revealed that Manchester City are also keeping tabs on the young center-back.